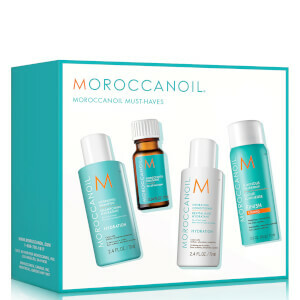 Discover the Must-Haves Try Me Kit from Moroccanoil. 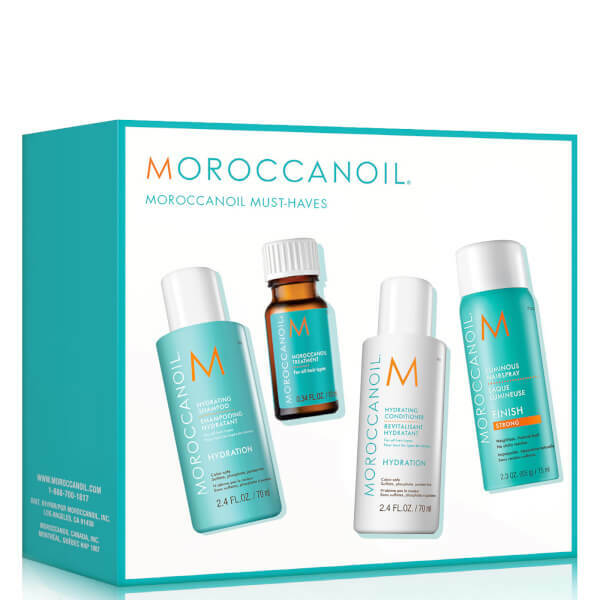 Combining four of the brand's favourites, the collection includes a shampoo, conditioner, hairspray and signature treatment that will leave your locks feeling cleansed and rejuvenated. Gently cleanse and refresh hair whilst restoring elasticity and vibrancy. Infused with Argan Oil, Red Algae and Vitamins A and E, the lightweight shampoo delivers replenishing nutrients to give dull, tired hair a boost in moisture. Locks are left healthy, hydrated and thoroughly cleansed. Transform weak, tired hair with the creamy, vitamin-rich conditioner; a deeply nourishing formula that works to hydrate and revive strands from root to tip. Harnessing the powers of Argan Oil and Red Algae, it moisturises and rejuvenates, whilst protecting against environmental and chemical stresses. A flexible hairspray for building long-lasting styles with movable yet strong hold. Powered by Argan Oil, the lightweight formula delivers a reflective shield of shine that fights frizz and humidity, without flaking or sticky residue. Ideal for creating up-styles, or before braiding for a salon-worthy finish. Hairspray: Hold 25cm from hair and spray for strong hold. For extra volume, spray on roots before styling. Hairspray: Sd Alcohol 40-B (Alcohol Denat. ), Hydrofluorocarbon 152-A, Va/Crotonates/Vinyl Neodecanoate Copolymer, Octylacrylamide/Acrylates/Butylaminoethyl Methacrylate Copolymer, Ppg-3 Benzyl Ether Ethylhexanoate, Aminomethyl Propanol, Argania Spinosa (Argan) Kernel Oil, Benzophenone-4, Parfum/Fragrance.